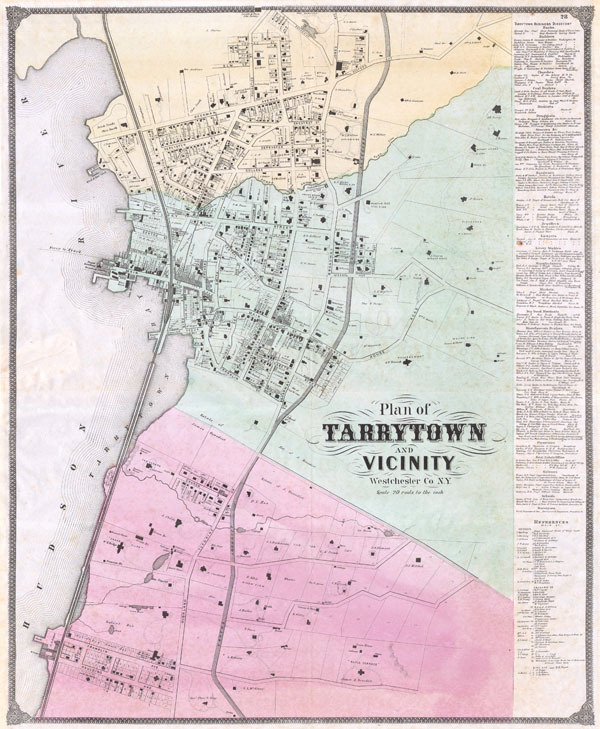 Plan of Tarrytown and Vicinity Westchester Co. N.Y. This is an extraordinary and rare large format F. Beers map of Tarrytown, New York. Map is a hand colored lithographic engraving dating 1868. Tarrytown is a prominent town on the Hudson river and the location of the important Tappan Zee Bridge. It is also the setting for the wonderful 19th century short story, 'The Legend of Sleepy Hollow.' This map shows the area in extraordinary detail and includes the names of individual households and land owners – even the shape of their homes! Right hand side of the map features a regional directory of Banks, Hotels, Markets, Livery Stables, Saloons, Schools, Blacksmiths, and many others. Produced by prominent 19th century American map publisher Frederic Beers in his seminal 1868 Atlas of New York and Vicinity. This map is extremely rare and the first we have seen on the open market. Very good condition. Old closed verso repair, from left margin, center. Original fold lines. Blank on verso.